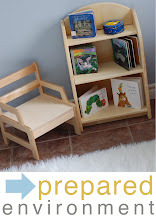 For summer, I have tried to find a few toys that I could play with the kids when they either need to get way from the sun, or during a rainy day. Although these have been scarce lately, we have found ourselves going inside a few times to get away from the heat. This week, I got this toy out. 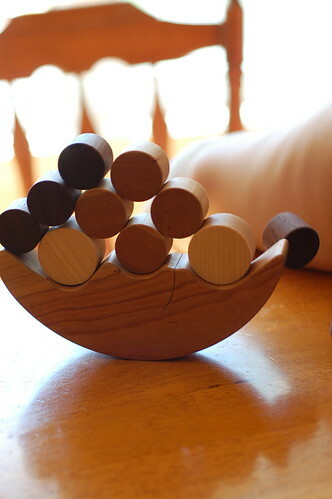 It is a balancing moon game that I found on Etsy. 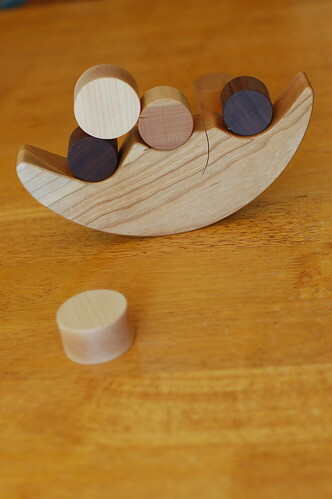 I like that it is handmade, with natural material, the quality is outstanding, and it is very inviting to play with. 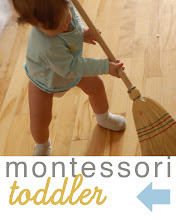 We have been playing many ways with this toy. Alone, or together, as a game or just an activity of balancing. 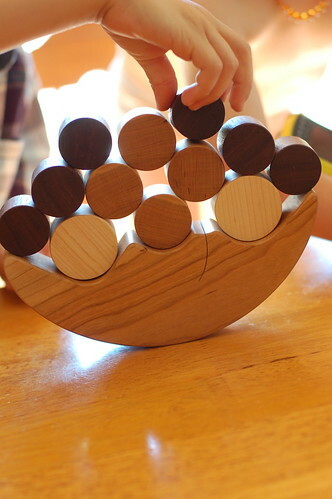 E has even found his way of playing with the parts of this toy: by using the wooden rods to pile them up, and even sort them by colours (and of course, trying to balance them on the moon, with a lot of success I might say!). 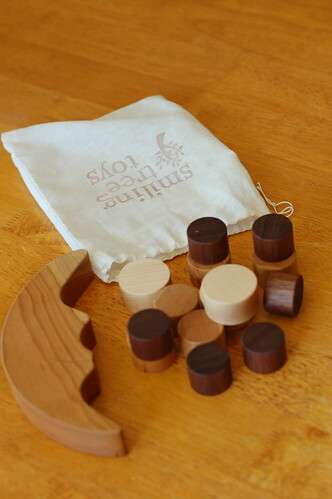 The kit comes in a drawstring bag, and contains the moon and 14 wooden dowels to balance on the moon. It is simple yet fun, it is open ended enough to be able to make many variation of the game, portable, and playable about anywhere. We are totally happy with this toy, perfect summer game. I adore the balancing moon. I've been on the look out for a reasonably priced one for a while now. Thanks for the link to the etsy store. I like how this one has so many rods with it. I'm going to order one. Between you and Kylie, I'm definitely going to go broke :D I'm such a sucker for beautiful things. Sunshine mama: I had seen something similar, but made out of painted wood, and I refused it too. I was SO glad to find a handmade option for this toy. Worth entirely what we payed for. I ordered our balancing moon the other day! Cant wait until it gets here! This is such a beautiful toy, I love the different stains!